The Solar System exercise gives participants a visual snapshot of their relationship constellation. It gives them information on who is in their life and how close they feel to those people, as well as an opportunity to express for themselves some of the qualities, strengths and challenges of their individual relationships. More than anything, the Solar System offers a bird’s eye view of our relationship life, and this perspective can bring valuable new awareness. This exercise can bring up difficult feelings for people. It can feel intense or hard for people to take stock of who they have in their life and how they have them. Some people will find it clarifying, hopeful, or reassuring to see how many people they are close with. Others can feel frustration or disappointment at the make-up of their support system. It can help the group to have the facilitator say, after the exercise not before, that this is an intense exercise that can bring up sadness or other feelings. Additionally, this is a very introspective exercise, so you may have to draw participants out a bit with several questions, a story or a few talking points. 1. Have everyone choose their favorite color from an assortment of markers, crayons, or colored pencils made available to them. With this color draw a smallish circle in the center of the page. This is YOU. Label it with your name, with the word “me” or with a personal doodle that you identify with. Instruct the participants to do the same. You can tell them that there are several steps to this exercise, and that you will outline all of them together and then leave them time to go back and add more to each step. 2. Have the participants put that color back and tell them they are not allowed to use it for the rest of the exercise. 3. Have the participants choose 3-5 different colors. 4. Choose 4-8 people in your life, who are closest to you. Plot them on the paper at a position and distance significant to you. Draw circles (or other shapes) around them. 5. Draw lines connecting you to these different people. These lines are like spokes on a wheel connected to you. These lines can be thick and bold, thin, jagged, dotted, loopy, any line you want. 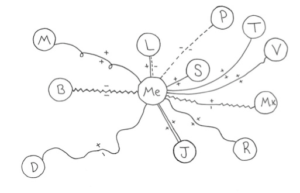 This is an opportunity to draw lines that represent an aspect of the connection you have to different people. For example, if my relationship to a specific person is hot and cold, I might draw a dotted line to show both connection and distance. 6. Next, we will illustrate the energy input and output each relationship represents. The question you are answering is: in this moment, is this relationship giving me energy and support or draining my energy? Using (+/-) or arrows to show the energy giving and energy depleting for your relationships. 7. It is important to remember that this is a snapshot of your solar system today. This is not an audit for your last year and it is not an audit of the lifespan of your relationships. 8. Give 10 minutes for them to work independently, including a short break. Debrief Questions and Points (5-15 minutes): Due to the intense nature of this exercise, it is important to debrief the experience with the class.  Why do you think I had you change colors? Answer: This is ME, this is YOU. Having ourselves in our own unique color helps solidify the idea of this line of distinction between ourselves and our world.  The bumper sticker for this exercise is: YOU ARE THE CENTER OF YOUR UNIVERSE. Why? Of course we all know this does not mean that you are the center of THE universe. But without YOU there would be no ‘your universe.’ It is okay and necessary for YOU to be at the center. It is more than necessary, it is accurate. When we start putting other people at the center of our universe, it can be really difficult to know what our boundaries are and where we can assert our needs, desires, and expectations.  What did you notice about your solar system?  What, if anything, surprised you?  What came up? What was it like to do this?  How is this like life? – Is everyone in your universe in a place where you want them? – Is there anyone who you want closer to you? – Anyone who you want further from you? – What can you do to bring people in who are currently far away? – Are there any people who you find exhausting to be around? – Any people who energize/revitalize you? – What can you do to distance yourself from people who you don’t want to be so close to you? Etc. – What if everyone is far away? – What if everyone is really close? – There might be real/strategic/good reasons why everyone might be really far away or really close right now. – Do you want your universe to look this way forever? – Is the mapping of your universe currently serving you? Is it meeting your needs? – Does the mapping of your universe match your values and intention? – This is exercise not about passing judgments about other people’s boundaries (i.e. “you have awful boundaries, my boundaries are better than yours”); this will look different for everyone. – Encourage participants to repeat this activity on their own every few months or once a year to see how their universe may change! Thanks to former Home Alive instructor and program director Becka Tilsen for sharing her description of this exercise.